As the truism goes, "where there is smoke, there is fire." But with a device called FIRESCAPE, firefighters can now see invisible flames from alcohol and hydrogen fires during the day and even see through smoke. NASA Stennis engineers devised a way to scan for hydrogen fires as part of rocket engine test programs. 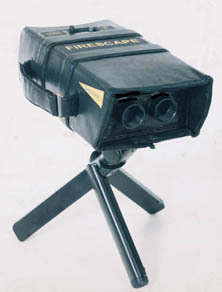 The technology fostered development of FIRESCAPE, a commercial unit to "see" the invisible flames of hydrogen and alcohol fires. An electronic flame imager, originally developed by NASA for rocket engine testing, is being manufactured and sold to firefighters by SafetySCAN, LLC. of Buffalo, New York. SafetySCAN, a company that specializes in opto-electronic sensor and display systems for firefighters, calls FIRESCAPE the first affordable commercial product for invisible (or ashless) fire imaging. The technology was developed by John C. Stennis Space Center to visually assess the presence, location, and extent of hydrogen fires. The need for such equipment was generated by the center's use of more than one million gallons of liquid hydrogen per month in its rocket engine test programs. Indeed, hydrogen fires are a significant risk. Previously, firefighters responding to a hydrogen fire had to give the suspect area "the broom test" by carefully probing the suspect area with a corn straw broom to determine the presence and location of a fire. This technique has significant safety and accuracy shortfalls, particularly in windy outdoor conditions where flames can easily change direction. "There was a huge gap in technology between the $3 broom and the $30,000 thermal imagers," says Heidi Barnes, a Stennis engineer who, along with colleague Harvey S. Smith of Lockheed, originally developed the device. "Firefighters need a reliable but economical device to assist them in their work. The technology was there; it has just been a matter of developing something relatively simple to use and getting it out there to them," Barnes says. The NASA-developed equipment detects and images the infrared emissions from the final combustion process, providing a true depiction of the fire size. Heat from vapors or surfaces is ignored, while the flames can easily be identified in the context of the unaltered surroundings. 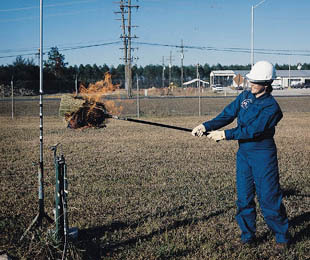 NASA engineer Heidi Barnes demonstrates the antiquated "broom method" of detecting invisible hydrogen and alcohol fires. Sunlight, fog, smoke, or mist do not significantly diminish imaging capabilities. The hand-held hydrogen fire imager can detect invisible flames of hydrogen and alcohol fires, but is also helpful for firefighters in controlling conventional fires. As a result of a market assessment performed by Research Triangle Institute (RTI) for Stennis, the fire imaging technology was determined to have commercial benefit. Based on this information, NASA applied for a patent. NASA's Technology Transfer Office then facilitated a briefing at which companies were introduced to the technology. Based on a review of competing product commercialization business plans, NASA granted exclusive patent rights to SafetySCAN. SafetySCAN has subsequently packaged the technology into a hand-held device weighing five pounds. FIRESCAPE has no moving parts and is used like a pair of binoculars. The optics are sealed within a case to protect them from smoke and grit. Within a five -second period, the device is up and running and can be used for two hours before recharging. A standard video output jack is provided to connect the imager with an external monitor or video cassette recorder. At a current price of $5,000, FIRESCAPE is within the budget of most fire departments. 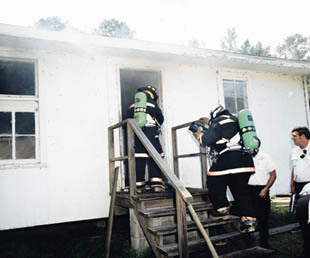 The Stennis Space Center fire department illustrates how the fire imager can be used to see through dense smoke to find a staged victim trapped in the building. In addition to safety, a primary benefit of using the fire imager is the simple employment of the device. With a push button on/off switch, and a button to compensate for sunny and cloudy conditions, the fire imager is a snap to operate. "SafetySCAN has been aided tremendously through the NASA technology transfer process; not only for the technical content developed into FIRESCAPE, but also for the national exposure associated with the process. This national exposure has resulted in early sales of FIRESCAPE," says Mark Stroze, president of SafetySCAN. Stroze adds that, ultimately, the fire safety market will be an even bigger winner through the potential of greater loss prevention. "And we are proud to say it all came about through the dedicated efforts of NASA, its affiliates and SafetySCAN personnel," he says.  FIRESCAPE is a trademark of SafetySCAN, LLC.